Mantras are invocations, praise, and prayers. 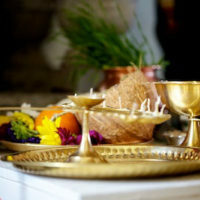 Through the meaning, sound, and chanting style, the mantras help a devotee focus the mind on holy thoughts, resonate with Veda, and express devotion to God. The body, heart, and mind blooms when we chant a mantra. The power of a mantra depends upon the way it is used. Chanting a mantra silently with focus and concentration makes all the difference, as well as the precise pronunciation. The universe manifested in a mathematically precise manner creating a very precise underlying structure to creation. The building blocks of that structure are mantras, which have a corresponding sound. Those sounds each have a specific quality which, when chanted, enliven that value in the physiology and psyche. The science of using the right mantra at the right time in the right manner is subtle indeed, just as using the right medicine at only the right time and dose is of great importance. On one level, a mantra is a sound. From another angle, a mantra is a word with a meaning. From another, it can be a name of a God… in other words, a name for one facet of the One. Some say a mantra should be done with reverence or it will not be effective. That is true and not true. If the mantra is repeated without reverence, it still has an effect. Slowly it will melt the ice. Slowly one will awaken to the warm sunshine of the depth of ones being from which the mantra emerges, for you are one with the Unified Field, the underlying basis of all that is. A mantra warms the soul, so to speak. As things thaw, life is felt more fully. The fine texture of Divine essence begins to be more fully felt from within. This naturally blossoms into reverence. On the other hand, if reverence is there already, so much the better. BUT we must be careful here. There is mood-making and then there is genuine reverence. Emotional indulgence is not the true reverence referred to here. Real reverence is an evolved state of physiology… not an attitude or mood. Remember, echoes of Truth perceived as Truth hold Truth at bay. The same is so for reverence. Clinging to what one may think of as reverence when doing a mantra could interfere with the blossoming of genuine reverence, which emerges from the very depth of your being. For this to occur in an undistorted, balanced, and fully integrated manner is most delicate. Feeling deeply and feeling deeply with refined pure tone are two different things. Like radio receivers, the same music may be heard, but with varying degrees of clarity… distorted or distortion free. Clinging to the distortion that has infiltrated the physiology inhibits the evolution of the reception. When the physiology is pure and free of stress or strain, the body thrills with the vibration of mantras naturally. Repeating the right mantras at the right time in the right manner over time creates that state of harmony within… harmony with nature… harmony with the true Self. To evolve means to reawaken to the You that eternally dwells deep within each individual. Mantras facilitate the process when used properly. Mantras are born out of the depth and can be used to awaken you to the depth.